What you are looking at is an amp that was engineered by one of the BEST amp designer/repairer in the industry! Mike Nicholls was on the Zed Audio team in the 90's, and helped engineer and design the LEGENDARY Hifonics GENERATION X amplifiers! 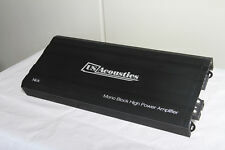 This US Acoustics Amp is in excellent condition in the open box. It features Thermally Stable Heat Sink design. 1 x 2500 Watts RMS @ 4 Ohm. RMS Mono at 1 Ohm 2500 W x 1 CH. RMS Bridged Mono at 4 Ohms N/A. US Acoustics "Nick". New US Acoustics Mono Block Amp. 2-year Manufacturer's Warranty. Fan cooled. Heavy duty aluminum alloy head sink. thermal, overload and speaker short circuit protection. Tiffany RCA input connectors. 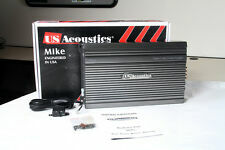 US Acoustics "Mike". New US Acoustics Mono Block Amp. Size (L x W x H) in 14.1 x 8.9 x 2.2. Variable Subsonic filter 15Hz to 55Hz. Variable Low pass crossover (24db/Octave) 35Hz to 150Hz. US Acoustic 3000D amplifier. Condition is Used. Amplifier is in 100% working order. I do not accept returns. Its rated 3500 or 3600w but actually does like 4000rms. very effecient, and good clean pwr. w/ bass knob.